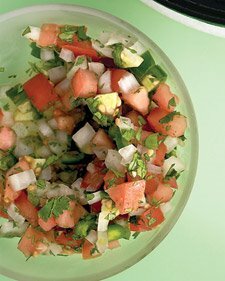 A perfect compliment to pulled-pork tacos or great on its own: this pico recipe is most delicious freshly made and eaten promptly. Combine ingredients in a bowl. Serve immediately, or refrigerate for up to 1 hour. Note from me: I like to use on-the-vine tomatoes. They are a bit smaller so I used 2 instead of 1. The serrano peppers are excellent if you can tolerate the heat. (I removed all the seeds.) Although I haven't tried this, you should be able to tone it down by using jalepenos in place of serrano peppers. Use a plastic glove or bag over your hand when chopping the peppers as the heat and "burn" your fingers.